The government has created a Green Transport Initiative to encourage people to ride to work. 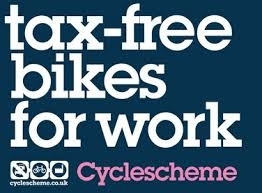 These schemes enable employees to buy a bike and cycle equipment TAX FREE through their employer. Once you have access to a scheme please call in to the shop. We can then help assess your requirements and you can choose a bike and any equipment you might need. We'll give you a quotation and any other information you need to apply for the scheme. Normally you do this on-line with a code we'll provide. Bring in the voucher for us to process (normally while you wait) and you can collect your new bike! You take a salary sacrifice for the cost of the bike & safety equipment. This is usually spread over 12 months, but may vary. The salary sacrifice is off your gross wage, so you do not pay income tax or Nic on the sacrifice. Please note there are can be added charges to cover our scheme costs on sale items or full custom builds. If you are self employed you can also register.